Although many of you think of TAG Heuer as a men’s only line…the fact is that they offer a diverse and beautiful collection of women’s watches, as well. The TAG Heuer Carrera Women’s Watch # WV2212.FC6264 highlights their feminine side elegantly. 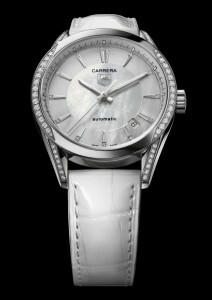 The TAG Heuer Carrera Women’s Watch # WV2212.FC6264 is a female version of the men’s Carrera timepiece. It is styled in white, with luxurious diamonds encircling the bezel and sloping down the sides of the bracelet. This TAG Heuer women’s watch is an automatic winding mechanical. That means you get all the charm of a true mechanical movement, without the daily winding. The Swiss automatic movement will remain reliable for a lifetime. The dial is crafted of white Mother-of-Pearl and features a date aperture. The dial is covered with a scratch resistant sapphire crystal. The case is made from stainless-steel and is set with diamonds, as is the bezel. The TAG Heuer Carrera Women’s Watch # WV2212.FC6264 is water resistant to 50 meters, but you won’t want to get this beauty wet. This elegant women’s timepiece also features a supple white alligator leather strap, complete with fold over clasp. The TAG Heuer Carrera Women’s Watch # WV2212.FC6264 with white alligator strap will be the perfect Christmas gift for her this year.